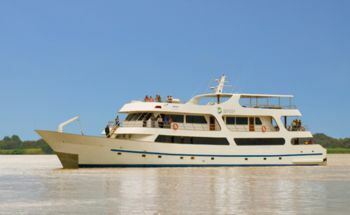 The Galapagos Yacht M/Y Odyssey offers avid nature travelers the opportunity to experience close encounters with the unique wildlife of the Galapagos Islands. The best way for a traveler to make the most of their Galapagos vacation time is to cruise around the Islands and experience several visitor sites each day. At Odyssey the focus is on the natural encounters with the unique Galapagos Islands wildlife. 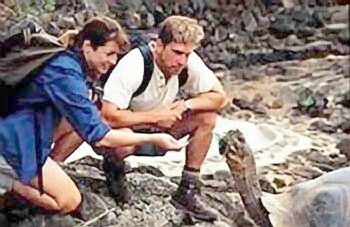 The well-planned shore excursions allow passengers to see up close the Galapagos animals and how they have adapted to the harsh island conditions. The M/Y Odyssey is a luxury yacht that represents a true evolution in the private yacht cruise industry. You will not find a private yacht in the Galapagos Islands that offers more space, comfort or service on a 16-passenger boat. Amenities on board include a Jacuzzi, alfresco dining area, spa service, spacious sun and shade decks, combined with elegant interiors and a cabin layout that allows for picture windows that can be opened for fresh airflow. Activities guests can enjoy are trekking, horseback riding, kayaking, snorkeling, and beachcombing, amongst others. In addition, a variety of visitor sites including volcano hikes, island trails, mangrove forests, turtle breeding farms, research centers, marine sites and more are offered. Capacity Permit for 16 passengers, capacity for 20. Ten cabins for passengers, all with lower berths. 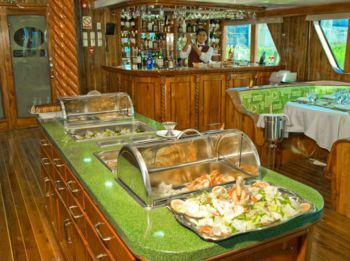 Four twin cabins are located on the upper deck, two twin cabins and two matrimonial cabins are located on the main deck. 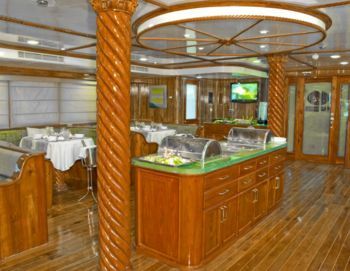 Two additional cabins are matrimonial/single cabins located on the lower deck and can be made available for tour leaders and/or single passengers. All cabins have private facilities, individually controlled air-conditioning, a small desk and sofa. All eight main and upper deck cabins feature large windows which can be individually opened. Safety Security Equipment: Smoke detectors and sprinklers throughout the vessel and automatic CO2 bank for kitchen and engine room. 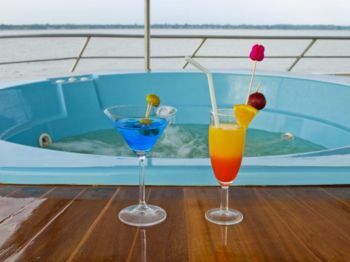 Decks (3): The highest deck is a sun deck with comfortable loungers and a Jacuzzi. 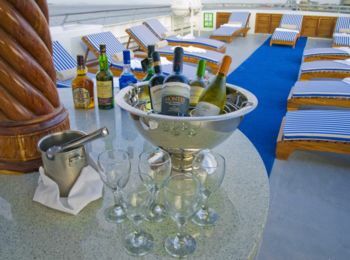 The top deck offers a shaded area and a cocktail bar. Besides a spacious lounge, dining area, bar and library on the main deck, there is a shaded outside space for alfresco dining.